The online version of this article ( https://doi.org/10.1186/s13072-018-0230-0) contains supplementary material, which is available to authorized users. In vertebrate genomes, CpG dinucleotides are relatively depleted, except in specific DNA regions with a high density of this dinucleotide. These regions are known as CpG islands (CGIs) and consist of short (~ 1000 bp) interspersed CpG-rich and predominantly unmethylated DNA sequences , which are associated with transcriptionally permissive chromatin state . Interestingly, the human genome harbours roughly twofold more annotated CGIs than the mouse genome (27,000 versus 15,000) . 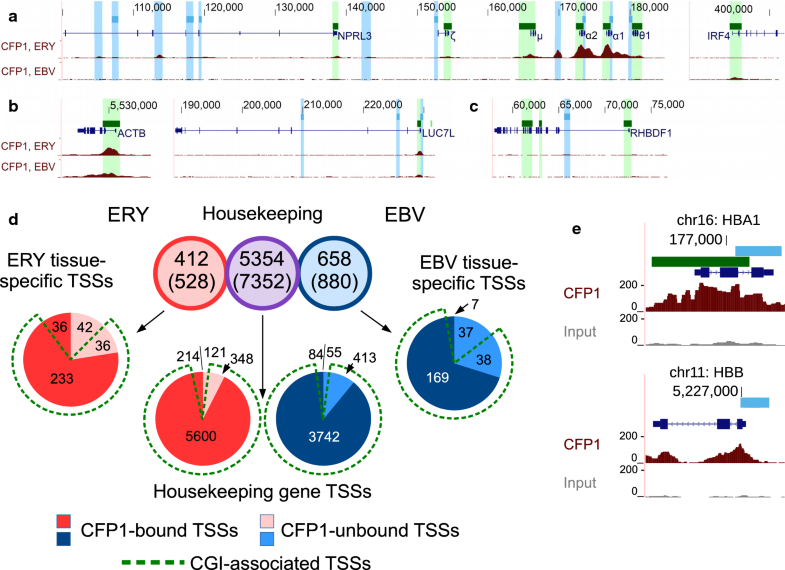 CGIs were originally identified in promoters of housekeeping genes and associated with H3K4me3 independent of gene activity . However, it is now recognised that CGIs are also found in about half the promoters of developmentally regulated/tissue-specific genes . In this group of CGIs, repressive polycomb group (PcG) complexes act to block transcription in inappropriate lineages or at non-expressing stages during the differentiation programme. It has been hypothesised that CGIs at developmentally regulated genes of higher organisms may be relics of ancestral CGIs which have been differentially maintained during evolution, for example, in humans and rodents [3, 4, 5, 6, 7, 8]. Thus, at present, the functional significance of these CGIs for the correct regulation of developmentally regulated genes is poorly understood. A good example of this is the well-studied α-globin locus. Mouse α-globin genes, which lack an annotated CGI, exhibit tightly regulated tissue and developmental stage-specific regulation similar to that observed for the human α-globin genes, which contain a CGI and are regulated by PcG . Several proteins have been described in mammals that bind specifically to CGIs. These proteins contain the CxxC zinc finger (ZF-CxxC) domain and include CFP1, MLL1, MLL2, KDM2A, KDM2B, TET1 and TET3 . Whilst MLL1/2 also have inherent histone lysine N-methyltransferase activity, CFP1 does not, instead forming complexes with SET1A and SET1B methyltransferases, TrxG subunits of the SET1 family . CFP1-SET1A/B complexes have been implicated in development [11, 12] and are known to target a proportion of H3K4 methylation to CGIs [12, 13]. CFP1 binds unmethylated CpG-rich sequence , and is associated with H3K4 trimethylation at transcription start sites (TSSs) irrespective of transcription level [15, 16], although recent evidence showed that it preferentially binds CGIs of actively transcribed genes . Two other TrxG complexes, MLL3 and MLL4, lack ZF-CxxC domains  and have been suggested to be involved in deposition of H3K4me1 at enhancer elements [18, 19, 20]. Multiple phenotypes have been documented for CFP1 deficiency, both at the cellular and organismal level. CFP1 is required for development , differentiation of embryonic stem (ES) cells  and haematopoiesis [23, 24, 25]. CFP1 binds to unmethylated CGIs in mouse ES cells [15, 17] and mouse brain tissues , and knockout and knockdown of CFP1 in mouse ES cells and NIH3T3 fibroblasts result in reduction of H3K4me3 levels at CGIs [16, 17]. Mouse ES cells lacking CFP1 are viable but are unable to differentiate [22, 26]. 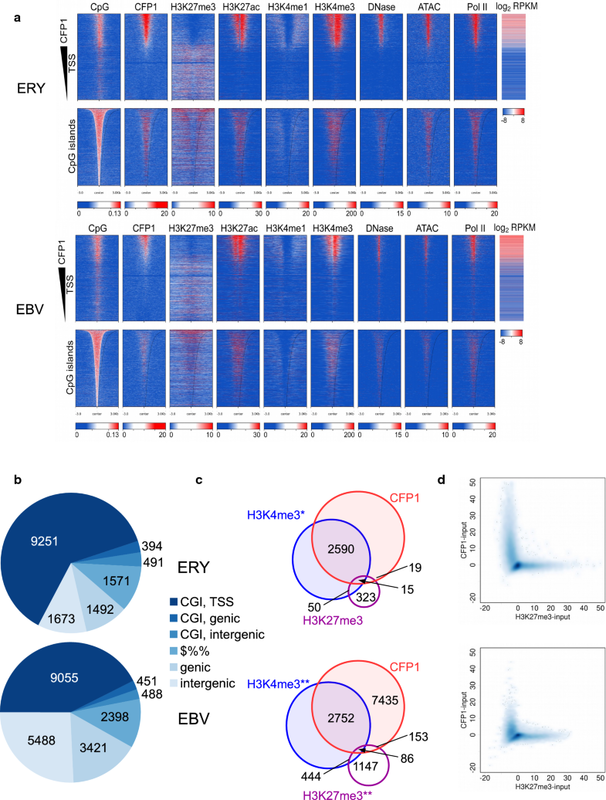 In these cells, H3K4me3 was found to be mainly reduced at highly expressed genes, while the levels at other CGIs such as bivalent domains were largely unchanged . These observations may be explained by the above-mentioned CFP1 preference for actively transcribed genes and the finding that MLL2 (rather than SET1) complexes are largely responsible for initial deposition of H3K4me3 at bivalent domains [27, 28]. The chromatin-binding properties of CFP1, aided by a SET1 subunit, anchor SET1A/B complexes in accessible chromatin [12, 13, 17, 26, 35], and these SET1A/B—along with other TrxG—complexes are responsible for H3K4 methylation in accessible chromatin [13, 18, 19, 20, 27, 28, 36, 37, 38]. To investigate this, we performed additional ChIP-seq experiments in erythroid cells. We examined genomic occupancies of SET1A (SETD1A) and Host Cell Factor 1 (HCF1/HCFC1), subunits of the SET1A complexes (Fig. 5, Additional file 1: Fig. S6), and RBBP5, a core subunit of all TrxG complexes [11, 39]. Previous studies have demonstrated a key role for CFP1 in the differentiation of mouse ES cells , murine early development  and haematopoiesis in mouse and fish [23, 24, 25]. Ablation of CFP1 reduces H3K4me3 at CGIs, especially downstream of the TSS, with only moderate changes in gene expression [15, 17]. Nevertheless, CFP1 lacking DNA-binding properties can target regions with pre-existing low levels of H3K4me3 . Interaction of CFP1 with H3K4me3 occurs via its PHD domain [17, 26]. Here we have studied the genome-wide occupancy of CFP1 in two human haematopoietic lineages. In agreement with a recent genome-wide study in mouse ES cells , we found CFP1 associated with transcription from CGI promoters in human haematopoietic lineages, with CFP1 prominently occupying TSSs of both housekeeping and tissue-specific genes. In addition to the understanding of the mechanisms by which CFP1-containing complexes bind to open chromatin in steady state, an enduring question is how transcription is dynamically regulated in a cell type-specific manner. Early genome-wide studies showed monovalent H3K27me3 is a mark of PcG binding at TSSs and is associated with silencing, whereas monovalent H3K4me3 at TSSs is associated with high expression in mouse ES cells. However, TSSs of genes poised for expression are found in an intermediate bivalent (H3K27me3/H3K4me3) state, which arises as a result of targeted H3K4 methyltransferase activity [44, 45, 46, 47, 48, 49]. Mutual exclusivity of repressive H3K27me3 and CFP1 genome-wide, as reported here, thus rules out CFP1-SET1 as the methyltransferase complex responsible for the transition of TSSs from repressed to bivalent. Instead, recent evidence shows that MLL2 methyltransferase activity is required for initial trimethylation establishing bivalent promoters in ES cells, whereas MLL1 is at least in part redundant [27, 28]. Additional file 1. Fig. S1: Analysis of CFP1 binding at individual loci and CpG islands (CGIs). (A-B) Analysis of CFP1 binding at the human α-globin locus in expressing and non-expressing cells. 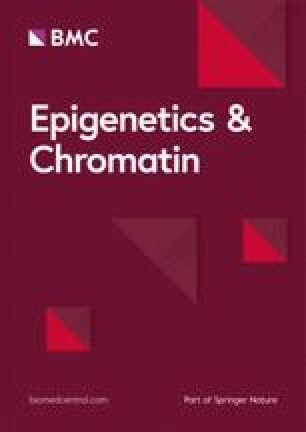 (A) Real-Time PCR analysis of immunoprecipitated chromatin using CFP1 antibody in human erythroblasts (red) and B-lymphocytes (blue). The y-axis represents enrichment over the input DNA, normalised to a control sequence in the human 18S gene. The x-axis represents the positions of Taqman probes used. The coding sequence is represented by the three exons (Promoter/Ex1, Ex2, Ex3) of the α-globin genes. 218 and hBact denote control sequences adjacent to the CpG islands of the human LUC7L (218) and ACTB promoters. Error bars correspond to ± 1 SD from at least two independent ChIPs. (B) Real-Time PCR analysis of immunoprecipitated chromatin using the CFP1 antibody indicated in humanised erythroblasts (normal, +MCS-R2 (left) and mutant, MCS-R2 (right). The y-axis represents enrichment over the input DNA, normalised to a control sequence in the mouse GAPDH gene. CpG Act denotes additional control sequence at the CGI of the mouse ACTB gene. The amplicons highlighted in red represent deleted regions in the humanised mice, for which no PCR signal is observed. Error bars correspond to ± 1 SD from at least two independent ChIPs. (C) CFP1 ChIP signal intensity in the top 200 peaks, by antibody and by cell type. Abcam, ab56035 antibody. Roeder, main antibody used in this study. (D) Analysis of CGI (green) and non-CGI (blue) transcription start sites (1-kb window, centred on TSS). Gene symbols shown with CpG content of individual loci in parentheses. Greek letters represent individual globin genes. Fig. S2: Peak overlaps of CFP1 and marks of active and repressed chromatin in transcription start sites (TSSs). Peaks were detected by MACS2. 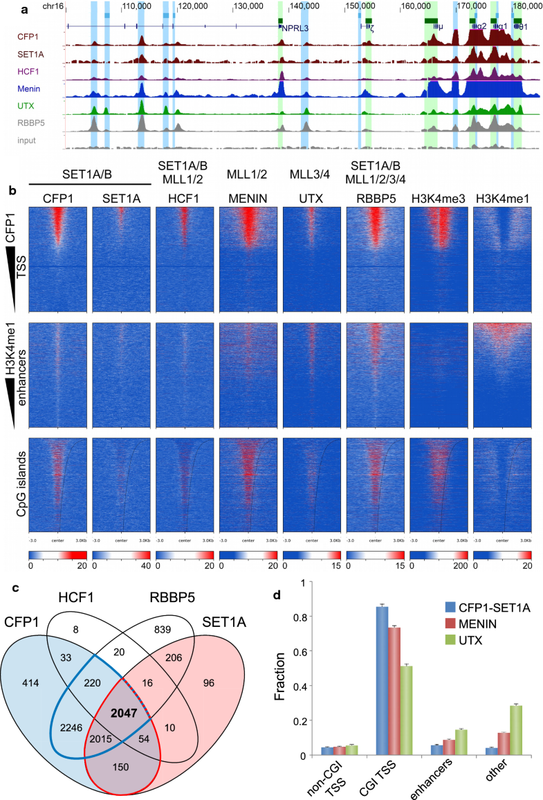 Venn diagrams show that CFP1 peaks within 1-kb of TSSs are strongly associated with H3K4me3 histone mark and poorly associated with H3K27me3 repressive histone mark. Cell types are (A) ERY and (B) EBV. Public data sets: * NCBI GEO GSE36985, ** NCBI GEO GSE50893. Fig. 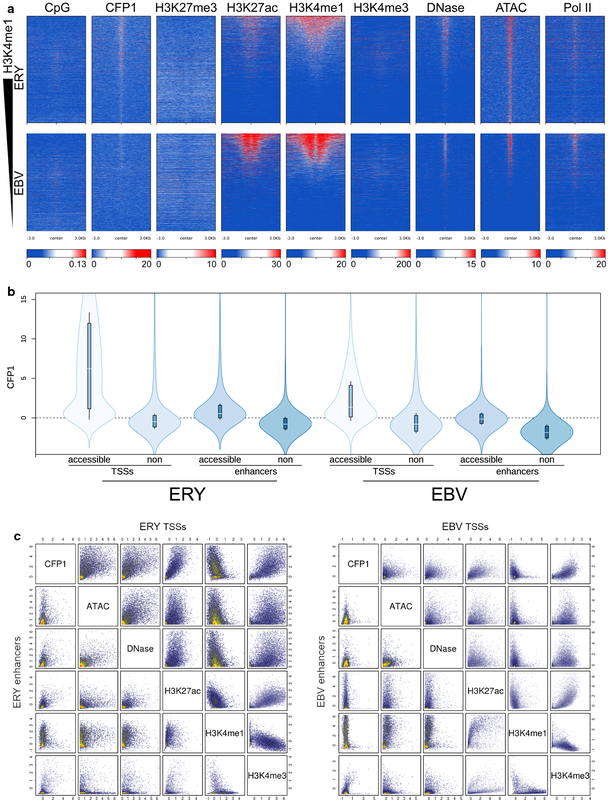 S3: UCSC tracks showing CFP1 and other ChIP signals in gene loci in erythroblasts (ERY) and EBV-transformed B-lymphoblasts (EBV). Hg38 coordinates for multiple genes, CpG islands (CGI, green boxes), and putative regulatory regions (blue boxes) are shown. 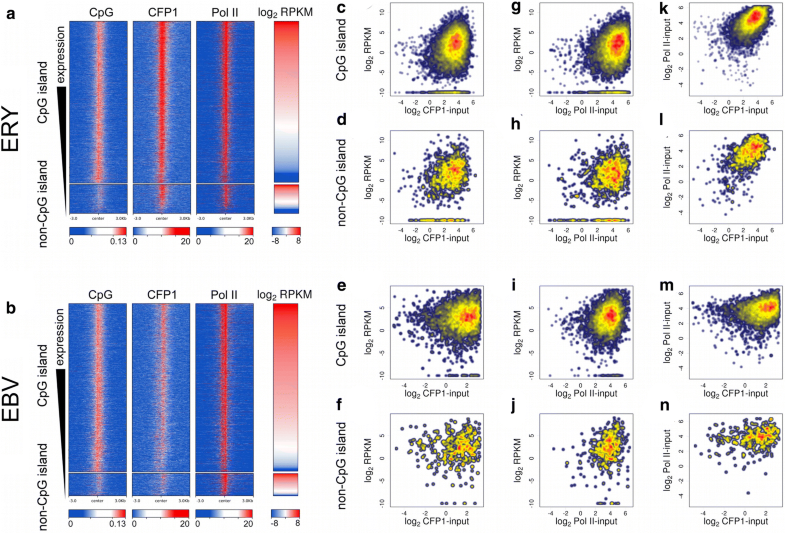 CFP1 signals are shown in dark reds, inputs in grey, histone H3 signals in blues and open chromatin marks in greens. All ChIP pileups are scaled to 1x coverage genome-wide and shown in a range 0–50, except CFP1 (Roeder) is shown with extended range and H3K27me3 graphs scaled by 2x. (A) Tissue-specific binding of CFP1 to CGI promoters of tissue-specifically expressed genes. Left (chr16), CGI promoters of active genes in alpha globin locus are CFP1-bound in ERY, and unbound in EBV. Flanking regions are included, with known tissue-specific enhancers. Right (chr6), first seven exons of IRF4 locus, active in EBV and inactive in ERY, with CFP1 binding to CGI promoter in EBV only. (B) CGI promoters of housekeeping genes are CFP1 bound and unmarked by H3K27me3. Left (chr7), ACTB locus. Right (chr16), LUC7L locus. (C) CGI promoter of RHBDF1 locus (chr16) has H3K27me3 mark and the absence of CFP1 binding in both ERY and EBV. Fig. S4: Western blot analysis of CGBP (CFP1) expression in mouse and human erythroid and human lymphoid cell types. Whole cell extracts (20 µg) were loaded in each lane (1) mouse ES, (2) U-MEL, (3) I-MEL, (4) mouse primary erythroblasts and (5) human primary T lymphocytes and (6) human primary erythroblasts and separated on a 10% SDS-polyacrylamide gel. CFP1 antibody was used at a 1:1000 dilution. Fig. S5: Similar cell type-specific CFP1 read depth at CGI TSS of HBA1 gene and non-CGI TSS of HBB gene. Upper two tracks use the main antibody, and second two tracks use the commercial antibody. Coordinates are from the hg38 human genome build. Read depths are averaged in 50 bp bins and normalised to 1x genome-wide coverage. Blue boxes, known regulatory regions; green box, CGI. Fig. S6: Distribution of TrxG components in erythroid cells. Green indicates CGI and blue indicates other putative regulatory regions. All loci transcribed right to left. Pileups are shown scaled to 1x genome coverage, with full scale 0–50x depth. (A) Housekeeping genes ACTB, left (chr7), and LUC7L, right (chr16). (B) β-globin locus (chr11), (C) Non-expressed RHBDF1 locus (chr16). Fig. S7: Overlap of TrxG subunit ChIP peaks in a high-confidence subset of regions. SET1A complexes are represented by CFP1-SET1A colocalisation. MLL1/2 complexes are represented by Menin, and MLL3/4 complexes are represented by UTX, respectively. HCF1 is found in SET1A/B and MLL1/2 complexes, and RBBP5 is a member of SET1A/B and MLL1/2/3/4 complexes. Red outline (4220 peaks) shows strong colocalisation of Menin and CFP1-SET1A, accounting for the vast majority (99.5%) of 4242 CFP1-SET1A and half (50.0%) of 8432 Menin peak regions. Majority (87.0%, 2089/2400 peaks) of HCF1 (blue region) is accounted for by approximately half (49.5%, 2089/4220) of regions of Menin-SET1A-CFP1 colocalisation. Regions where either SET1A-CFP1 or Menin or both are colocalised with HCF1 (blue dashed line) accounts for nearly all (99.6%, 2390/2400) HCF1 regions, suggesting that HCF1 bound to DNA is primarily present as part of SET1A/B or MLL1/2 complexes. Fig. S8: Chromatin accessibility in TSSs and enhancers in erythroid cells as measured by ATAC-seq and DNase-seq. 1x-normalised, input-subtracted signals from ATAC-seq and DNase were averaged in a 2-kb window about TSSs and putative enhancers. Z-score transformed values for ATAC-seq and DNase-seq at a given locus were averaged. Fig. S9: Relationship of CFP1 signal to three predictive factors in top-decile open chromatin regions. A linear combination of CpG density and SET1A and H3K4me3 ChIP signals explains a substantial fraction of variation in CFP1 ChIP signal. Table S1: Bias of CFP1 for CGI TSSs in cell types and gene classes. Table S2: Bias of CFP1 for housekeeping gene TSSs. Table S3: Motifs associated with CFP1 peaks. Table S4: Dependence of CFP1 ChIP signal in erythroid cells on covariates putatively associated with its binding. Table S5: Analysis of variance of CFP1 signal in top-decile open chromatin regions surrounding TSSs and putative enhancers.